Mr Conlon, who received a personal apology in 2005 from the then British prime minister, Tony Blair, says he believes Brendan McConville and John Paul Wootton may have also been wrongfully convicted of an IRA attack -- as he was in 1975. In March 2009, a Continuity IRA sniper attack on a Crown force patrol claimed the life of Stephen Carroll, a member of the PSNI and RUC police for over 24 years. The attack, coupled with a deadly ‘Real IRA’ attack on Massereene British Army base the day before, led to an extraordinary security backlash and the arrest of Mr McConville, a former Sinn Fein councillor, and John Paul Wootton, then just 17 years of age. After a fraught and confused trial, McConville was handed a sentence of at least 25 years, while 20-year-old John Paul Wootton was told he would serve a minimum of 14 years. Speaking to the Beklfast-based Irish News, Mr Conlon, chairman of the Justice for the Craigavon Two campaign, says the convictions are unsafe. “I have to say I am not a republican in any shape or form and I do not advocate anything to do with republican dissidents, violence or anything,” he says. He said he believes authorities were under immense pressure to secure a conviction. He said the authorities “had such a terrible result in relation to the Omagh bombing, in relation to Sean Hoey, then they had the farce with the UVF men and their super-grass trial”. “Then you had the acquittal of Colin Duffy,” he said. Mr Conlon said he is concerned that McConville and Wootton, who will appeal their convictions next year, have been unfairly targeted. “There seems to be a rush in this climate when people are unable to find out who is doing what,” he said. “They arrest people to satisfy the anger of the public and the outrage of politicians. “That can’t be the basis for any fair judicial society if someone has suffered a grave and gross miscarriage of justice. Conlon’s story is well known from the film ‘In the Name of the Father’, which told the story of Conlon and his father Guiseppe and their campaign for freedom. Arrested just before Christmas in 1974, the young Belfast man was wrongly convicted in October the following year after he was accused of taking part in a Provisional IRA campaign in Britain. Three others - Paul Hill, Paddy Armstrong and Carol Richardson - were also charged in connection with an attack in Guildford, and became known as the Guildford Four. It later emerged that Mr Conlon made a false confession after being beaten and tortured. 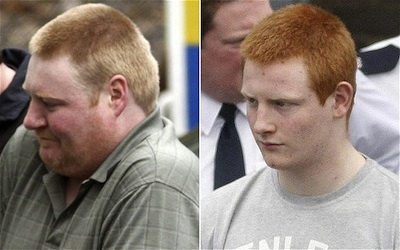 Guiseppe Conlon, who had travelled from England to help his son, was sentenced to 12 years after he was arrested in the north London home of Annie Maguire along with six others and accused of possession of nitro-glycerine which at the time was used by the IRA to make bombs. Each of the Maguire Seven, who were all jailed from periods of between four and 14 years, were later found to be completely innocent. Despite a campaign for his release, Guiseppe Conlon died in Hammersmith Hospital in January 1980, five years into his jail term. His son warned that their tragic experience at the hands of British justice could be repeated. “We can’t have innocent people going to jail and 15 years down the line them being released and their lives ruined and not only that, the lives of their families being ruined,” said Mr Conlon. “But you have to have the courage of your convictions to stand up for what you believe in and I believe a miscarriage of justice took place here on the basis of all the evidence I have read. He said he intends to raise the issue with all the north’s political parties and the Dublin government in the coming weeks. “Everything I have read leads me to believe this is a miscarriage of justice,” he said. Among the doubts about some of the evidence used to convict the pair are accounts provided by a man known only as ‘Witness M’ who gave evidence against McConville. He claimed that while out for a walk on the night of the attack he saw the accused. During the trial defence solicitors said that ‘Witness M’ was a “Walter Mitty type character who liked to tell tales”. They said ‘Witness M’ lied to the court “at least twice and maybe three times” about the state of his eyesight and that he changed his account of what he claims to have seen. Although ‘Witness M’ denied he had issues with his eyesight, he is believed to suffer from astigmatism, which prevents the eye from focusing properly, as well as short-sightedness. Campaigners say it would have been impossible for ‘Witness M’ to identify McConville on the night of the shooting at the distance he claimed to have seen him. During the men’s trial it was also claimed that a jacket owned by the former Sinn Fein councillor was found by police in the boot of a car owned by Wootton. ‘Witness M’ claimed to have seen McConville wearing a green knee-length coat with a German army logo. The coat recovered from Wootton’s car was a brown waist-length jacket, campaigners say. As well as containing McConville’s DNA the jacket also contained samples of firearm residue and DNA belonging to several other people. Campaigners believe the presence of numerous DNA samples and McConville’s denial that the jacket belonged to him casts doubt on the reliability of the evidence.